Save the World Motivational. . Wallpaper and background images in the Critical Analysis of Twilight club tagged: anti twilight funny buffy. Epic fail au epic win? Yes! Kill him Buffy! The world will be a better place! ^ No, she'd probably just think he's an annoying prick. And please do not compare BAMF vampires like Spike or Angel to Edward again. I'm with GemonkDruid and IzzyOzera!Do NOT compare Spike or Angel with Discoballs! Lol, hurry slay him before there is another twilight. I wonder if he will turn into sparkles in case of ashes. AHHHHHHHHHHHHH dont think about it again... think of a happy place. that stake looked pretty pointy... im team switzerland.!!!!!!!!! by the way what did bella do to switzerland anmmy way?? I'm with IzzyOzzera and gemonkdruid! PLEASE do not compare real vampires with Edward! 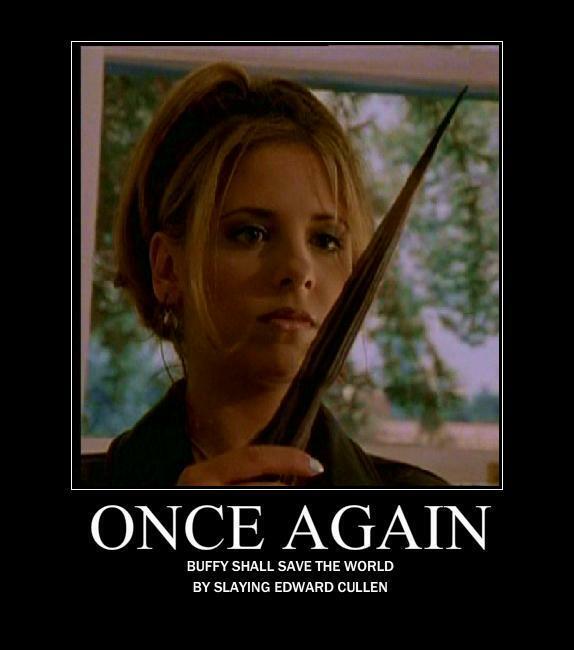 yeah Buffy u do that!!! Imprinting was inspired kwa ducklings and dragons.